The amount of data storage it's possible to cram onto the same area of magnetic hard drive platter rises every year - we're fast approaching multiple terabytes per square centimetre. As it does, a problem arises. Hard drives are a bit like vinyl records, y'see. 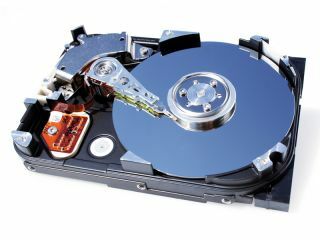 Data is stored in the magnetic equivalent of vinyl's grooves, and can only be read by putting a magnetic drive head directly above that point. As storage gets denser, you need to place the drive head more and more accurately to get to the information you want. How accurately? Right now, to within 25 nanometres. But within a few years the necessary accuracy could increase substantially. "The actuator mechanism will need to be able to position the recording head with a precision of just one or two nanometers," explained Jiaping Yang from Singapore's Agency for Science, Technology and Research. "The actuator schemes commonly used today can offer a fast response, but will have difficulty achieving the positioning accuracy needed for future high-density drives." So Yang's team has been investigating new ways of attaining that accuracy. Top of their list is a comb-like set of silicon teeth, interlaced with polymers that expand and contract when the head is applied. "Silicon has high thermal conductivity but small thermal expansion, while the polymer expander has a large thermal expansion coefficient, but low thermal conductivity," explained Yang. "When we resistively heat the element by applying electricity to the silicon, the polymer expands, causing the silicon comb to bend." While similar approaches have been tried in the past, they weren't capable of a large enough range of motion. Yang and his team fixed that by adding a rotary lever action that sextupled the distance the arm could reach. The only drawback right now is that it's a little slow - something that the team is working on. "We are now exploring possible approaches to improve actuation speed performance, such as designing a more efficient heat path, investigating new thermally active materials, and further miniaturization of the actuator footprint," said Yang. The full details of the research can be found in a paper published in the Journal of Micromechanics and Microengineering.